You can automatically sync all your tasks that have due dates and tasks that are in your “Today” folder to any calendar that can subscribe to .ics calendars. This includes Google Calendar, Apple OS X Calendar, and many more. Currently we only support one way sync. What that means is that any changes you make on the Get It Done app will get synced down to your calendar, but changes made in your calendar do not get reflected in your Get It Done app. You will first need to be logged into your Get It Done account. 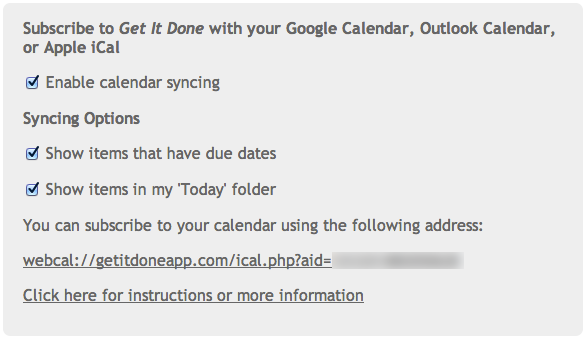 If this option is checked, ALL of your tasks in your ‘Today’ folder will show up in your calendar under today’s date. This is your unique address you can use to subscribe to your online calendar. We will talk more about how to use this address in the tutorials below.